I created a very similar taco at home. Here is the recipe. Hope you enjoy it. It’s not exactly taco truck, but it is pretty damn close. Also, if you like a nice economical meal, it is a cheap dinner for the family that is quick and easy to make. Let me know what you think! Heat the ground beef in a medium high pan. Add cumin and salt and pepper to taste the ground beef, continue to brown for about 5-8 minutes. Once cooked all the way turn heat down to lowest setting to keep warm. While the beef is cooking, chop the red onion and cilantro and mix the two together. Set aside. 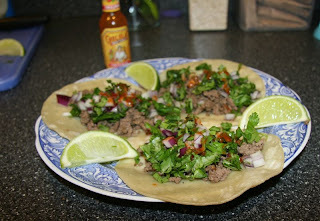 Assemble tacos by placing spoonful of beef atop tortillas then spoon cilantro and red onion mixture over beef. Add some hot sauce and serve with sliced limes. Squeeze lime slices over tacos and enjoy. Sounds like a good recipe. I remember you bring us a whole bunch of them to eat. This reminds me of the great lunches we used to have at Detroit Edison in Mexican Village. Except we would have diced steak or chicken tacos. What makes them so special is the fresh cilantro, pico and lime juice! Tonight i'm making shredded chicken tacos by coincidence!